We're supposed to be looking for Loki, right? 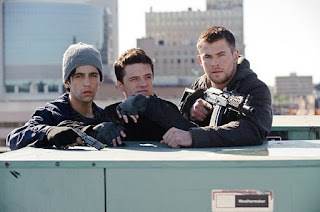 One thing I learned watching the remake of Red Dawn is that Bane had an easier time taming Gotham City than the Korean People’s Army does keeping control of Spokane, Wash. Or, maybe that Thor trumps Batman. Either way, this update of the Reagan-era Red Scare flick is silly without the fun, a preposterous script that’s high on xenophobia but low on nuance and common sense. Fresh back from a tour of duty in Iraq, Jed Eckert (Chris Hemsworth) gets back to his Washington state home just in time to watch little brother Matt (Josh Peck) quarterback the high school “Wolverines” to a loss in the big game. Oh, and to see the North Korean army parachute into town, capturing everyone except the handful of teens that Jed shepherds to safety in the surrounding hills. Adopting the name of their high school mascot, the Wolverines embark on guerilla warfare, which Jed explicitly and somewhat offensively patterns after the very insurgents he fought back in Iraq. It’s hard to empathize with these freedom fighters when they can so easily saunter around town and even enemy headquarters, picking off Korean interlopers without much threat of reprisal. Of course, the fact that the actual North Korea recently failed to even launch a missile successfully makes their ability to swoop in and occupy the Pacific Northwest appear even more ludicrous, even with the aid of cyberterrorism alluded to during actual news clips of President Obama and others that open the film. When the Koreans finally do strike back, it is with a knowledge and purpose that suggest the presence of a mole that never comes to fruition. That’s just one of the gaps in this hole-ridden plot. But the biggest problem is that while the 1984 original was at least subversive enough to put fresh-faced Brat Packers in peril, here we get a cast of mostly unknowns, led by an Aussie actor proclaiming, “This is our home.” Still, Hemsworth looks like Olivier next to the rest of the vapid cast, including a perpetually petulant Peck, Tom’s adopted son Connor Cruise, a grousing Jeffrey Dean Morgan and two actresses—Isabel Lucas and Adrianne Palicki—who manage to keep their hair and makeup in check for the Eckert boys even in the middle of a war zone. Directed by longtime stunt coordinator Dan Bradley, the action scenes carry little resonance beyond shaky-cam urgency. And every time the script flirts with complexity, whether about the town’s coterie of collaborators or the wider reaches of the conflict, it retreats back into a shell of training montages and risible platitudes. There’s an enemy to be fought in Red Dawn: boring movies.